Pain in the upper back is an extension of problems lower down in the body and they often appear after a person has previously suffered with low back pain. Upper back pain is usually felt between the shoulder blades or up closer to the neck area and is exasperated by carrying the weight of the head and arms around on muscles that are often tight and weak with poor circulation. People who work using their arm in a fixed position such as at a computer all day, or a mother constantly carrying young children, usually suffer from upper back pain more than someone who doesn’t. To successfully treat upper back pain a therapist needs to address problems with the core muscles lower down the body to improve circulation to the upper back. The tighter the muscles lower down the back, the more pressure is on the upper back area and the more likely a person is to get upper back pain. Because the upper back is under constant pressure throughout the day with the weight of the arms and head being carried, treatment is best combined with a series of exercises and self-help techniques to help maintain suppleness and circulation to the area. If the treatment being applied only obtains very slow results it can often be a case of one step forward and one step back and the person with the upper back pain gets nowhere close to a lasting solution. The daily assistance of self treatment techniques and the right exercises assists this process greatly. Another common cause of upper back pain is from whiplash received in a car accident. Often the initial soreness from the accident clears up and the person doesn’t realise there is a more sinister problem lurking until many months later when the discomfort and headaches begin. The whiplash produces a serious trauma to the muscle tissue in the upper back and this affects the circulation. After many months the lack of circulation contributes to a weakness developing and this then leads to upper back pain and often the headaches or migraines. Upper back pain can also come from overloading the area by not having the necessary strength, such as happens with a mother who has two or three children in a row and is endlessly carrying them and everything else whilst keeping house. Problems that begin as upper back pain can also spread down the back and end up causing low back pain or another pain in the lower extremities. In some cases problems that start as upper back pain can end up as sciatic pain which can make the current problem very difficult to diagnose and treat. This is why ultimately the best therapy approach is through a full body treatment that deals with the old and new problems and balances the muscles throughout the whole body. To better diagnose your upper back pain and understand which muscles in the body are contributing to it through their dysfunction, the SLM Yoga exercise program that is included with the ‘Online Rehab Program for Sciatica and Back Pain’ works very well. This exercise workout plus the self-help techniques it contains will show you ways to effectively self treat your pain that no one else knows. To understand upper back pain more fully start by watching a FREE video demonstrating a great technique for getting FAST relief yourself at home. Start here. 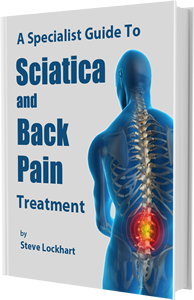 Are explained on this site and in more detail in the Self-treatment Program for Back Pain & Sciatica. Start here.